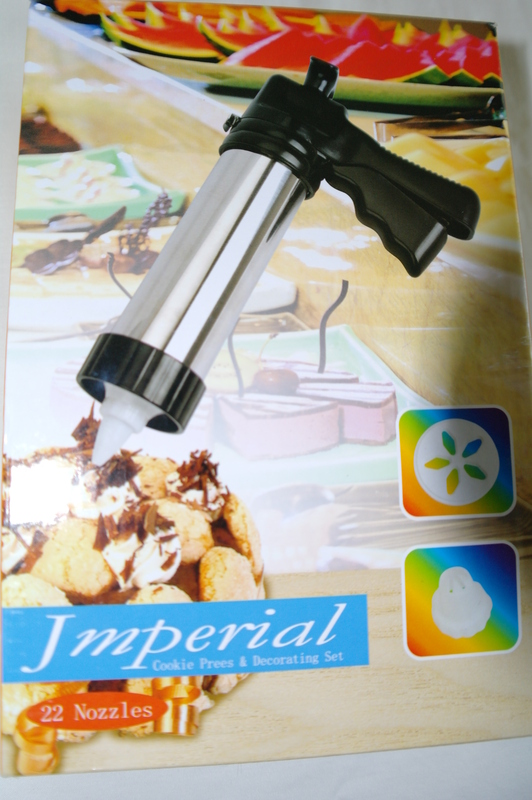 For a while I have wanted a cookie press, particularly since making Viennese Biscuits by pushing the dough through an icing nozzle thus creating what looked like a gemors (mess) but tasted divine. As with anything costing over R100 we shopped around. Cliff found a new baking shop in Boksburg called ‘The Cake Tin’ and bought me one as a gift yesterday. He forgot to remove the price, at R135 this store had the best price on this product. The Cake Tin don’t have a web site but their ph. no. is 011 8948168. This morning I was awake before dawn and baking merrily. At first I was disappointed, but this was because I was trying to press them in mid air, yes I know it was pretty dumb but I had been awake since 5.30am. When Cliff joined me in the kitchen he suggested pressing down on the baking paper and voila! 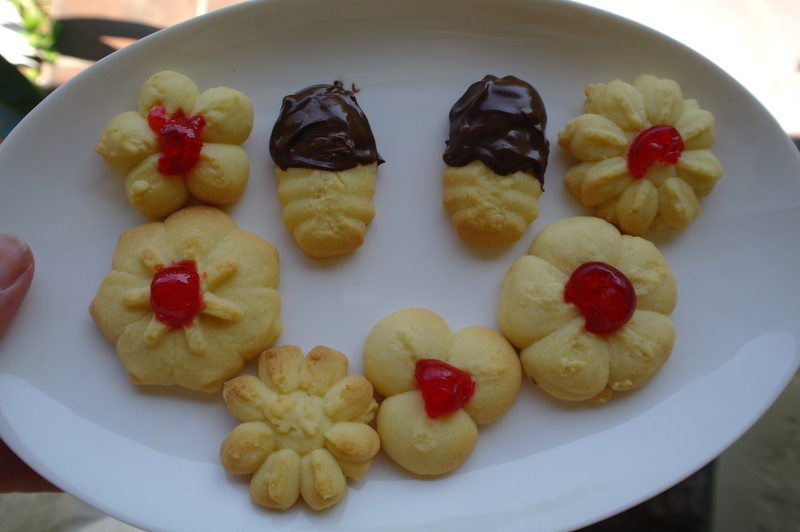 Lovely shaped cookies. The Cookie Press comes with absolutely no instructions …. I like instructions. If you have recently bought one and looking for tips here are a few. Of course you may have had more sleep than me and be a bit sharper. 2. When putting the disc in, the flat side should face the outside. 3. Press down on the baking paper and press for one or 2 clicks, if you hold the trigger in for a while after one click it’s about perfect. On mine a little dough escaped to behind the plunger but not much, I just fished it out at the end and used it. 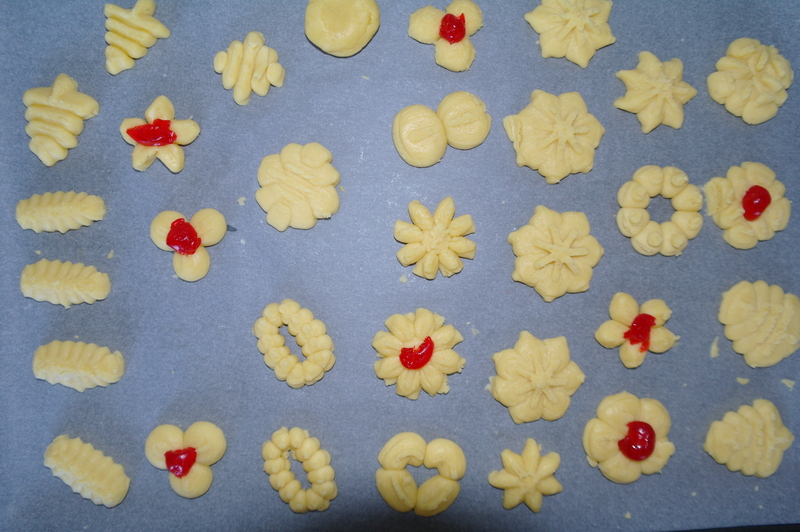 I have tried to use the cookie press to make ginger biscuits, the dough is soft but obviously not soft enough. After trying a few recipes I have found that the only one which works well is the Viennese biscuits, so I’ll just stick to those. Maybe other cookie presses are more robust and can handle slightly firmer dough, I don’t know this is the 1st and only one I have ever used.